On September 1st I challenged myself to a month of eating entirely raw vegan. It was surprisingly easy. For some reason that “thing” clicked and I was able to keep my commitment to myself even with traveling and social events. Seeing quick and noticeable results definitely made it easier. To date I have lost 30 lbs through this change in my diet and a consistent routine of exercise. So here it is. My official invitation. If you’ve been thinking that you wish you could do something like what I’ve been doing I am going to outline my next week. It’s complete with links to recipes and sassy commentary. If you want to jump in and do this with me 100% that’d be great. I would love to hear about your experience with it. If going full out raw vegan still seems too intimidating, then I encourage you to try a few recipes. Maybe start with replacing a meal or a snack a day with something here. My bonus sister is getting married in 13 days and I intend on going full out with my commitment. I find that when I eat a completely raw diet my skin looks better, my attitude is more positive, and my body absolutely shifts. Breakfast -I don’t measure I kind of just dump it all in and blend it up. Lunch- These are so fresh and delicious. I skip the cashew paste and just do the veggies, although I’m sure it’s delicious. I also top these with some tamari (coconut aminos if you’re going soy free) and Tapatio. Dinner– I find this is so perfect for fall. It’s loaded with veggies and it’s a hearty satisfying meal. Breakfast– Nothing fancy, my breakfasts are always pretty small and simple because this is when I’m trying to drag two munchkins to the gym every day. Lunch- I haven’t tried these yet, but I’m pretty excited about them. I haven’t experimented with sprouting my own seeds, yet. I want to try it out in the next few weeks or so. Dinner- I use the recipe for the brown rice and then chop and add a mix of whatever veggies we have on hand. I LOVE this recipe! Lunch- Maybe this is the recipe I am most excited to try… I’m not sure. I feel like there’s a lot to look forward to this week. Dinner- Probably one of my favorite recipes. These are both super easy and really delicious. If I’m trying to convince someone that this is indeed “good food” this is my go to meal. Ingredients: 1 bunch of kale, 1 ripe avocado, 2 various citrus fruits ( I like 1 grapefruit and 1 orange), sesame oil, tamari (gluten free soy sauce), raw pumpkin seeds, raw sunflower seeds, dried cranberries. Assembly: 1. 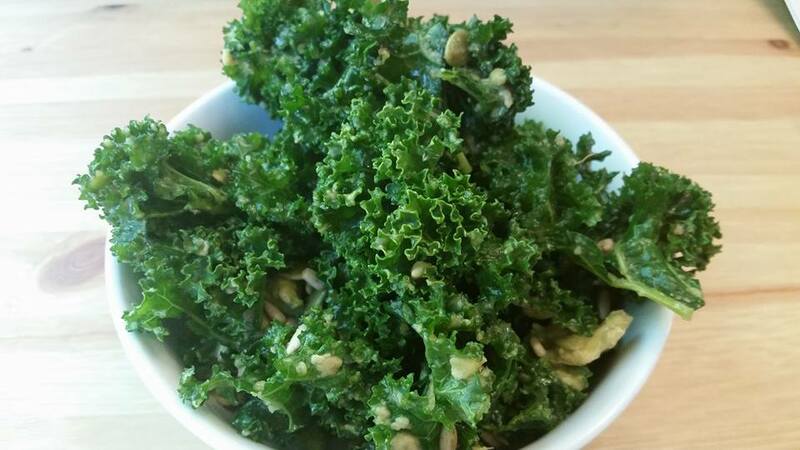 Wash and chop the kale, place it in a large salad bowl. 2. In a separate bowl mash the ripe avocado. 3. Squeeze the juice from the citrus and pour into the bowl with the mashed avocado. 4. Add a few dashes, maybe 1 tbsp. of sesame oil, and 2 tbsp. of soy sauce into the bowl of avocado and juice. Wisk it together. This becomes your dressing. It’s okay if the avocado is a bit chunky. 5. Toss the dressing with the kale. 6. Sprinkle on the sunflower seeds, pumpkin seeds, and dried cranberries. Berry bowl- combine fresh blueberries, raspberries, and quartered strawberries, toss in a handful of almonds or walnuts and sprinkle with cacao nibs. Lunch The same recipe from last night, because I know I’ll want more! Dinner If you don’t already have a spiral slicer, I highly recommend it. Making zucchini noodles is so easy with it. Smoothie- I’ll decide when it’s time whether it’ll be a repeat of Monday or Wednesday. I just realized the Monday, Wednesday, Friday are my swim days… it totally makes sense that I make smoothies for these days since we are always running out the door in a rush. Collard green burrito– this one seems a bit more intimidating, but you just toss it in a food processor or blender. Super easy. This is one of my hubby’s favorites! Raw Vegan Mac and Cheese I’m really looking forward to this one. If you try it before Friday, please let me know what you think. Snacks for whenever the need arises. I have a major sweet tooth and am also guilty of snacking when I’m bored. With these in my arsenal, I know I can snack without regretting it. All of the recipes here and a few more can be found on my Pinterest board if you’d like to check it out.